George Maxwell: You...It's you! But you're dead! Edward Lionheart: No. Another critical miscalculation on you part. I am well. It is you who are dead. During the early 1970s, Vincent Price starred in three films that were really struck from the same mold, that of the vengeance-minded serial killer who dispatches his victims in imaginative and bizarre ways. The first two of these are The Abominable Dr. Phibes and Dr. Phibes Rises Again. 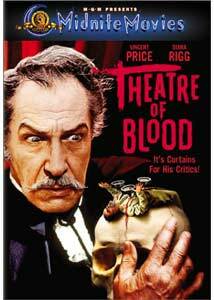 Wrapping up this not-really-a-trilogy is the wild and blackly amusing Theater of Blood (Although most references I've seen use the British spelling Theatre, it appears in its US form as Theater on the case and in the credits). Edward Lionheart (Price) is a hammy Shakespearean actor who is believed to be dead. Alas, to the dismay of his critics, he got better and now seeks revenge upon them for denying him the accolades he feels were due him in his earlier life. But he doesn't just kill them or torture them - .he kills them and tortures them with methods taken directly from the Bard's plays! The results are imaginative, somewhat gory and always entertaining. The script is witty and clever, but the stellar cast makes it come alive wonderfully. Not only does Price for once get to let out all the stops and chew the scenery to his heart's content, but he's set off against a more restrained cast, including the wonderful Diana Rigg as his daughter Edwina. The critics are a veritable Who's Who of the British film industry, featuring Ian Hendry, Coral Browne, Jack Hawkins, Diana Dors, Dennis Price, and Michael Hordern, among others. The very funny Milo O'Shea is also featured as a befuddled police inspector. Their performances are dry and sure to elicit a chortle. Although there is a good deal of humor, it's definitely gallows humor. At times, Price's lines seem to presage the wiseacre comments of Freddy Krueger. The murders are often bloody and gruesome in the best Shakespearean tradition, though the camera doesn't linger too long on the gore in most instances. The story has a few shortcomings and holes (e.g., how did that severed head get from the bedside to Hendry's milk bottles? ), but the ride is too much fun to be very bothered by them. The ending drags just a tad, but it's worth it to hear Price do King Lear in the final sequence. Price's delivery in that wonderful voice makes one wish that he had done some genuine Shakespeare on screen. He's clearly having a terrific time in this picture, and I certainly did as well. Even though I've seen this so many times I practically have the dialogue memorized, the film is still highly entertaining. Image Transfer Review: The nonanamorphic picture is heavily grainy and has quite a few speckles running through it. The black levels are very good, but there is a tendency for the picture to be on the dark side. The picture is lacking in detail and generally without crispness. This is certainly not a reference transfer. I've never seen a really good presentation of this film, however, and this is as good as it's ever looked to me. I remain hopeful that there are good elements for this picture out there somewhere, but this will do in the interim. Audio Transfer Review: Unfortunately, the audio is even worse than the video quality. The beautiful theme music is highly distorted. Dialogue is occasionally unclear as well. Plagued by persistent hiss and frequent clicks and pops, this is a rather irritating and unpleasant audio track. The French and Spanish soundtracks are generally rather better sounding, though obviously unsatisfactory from a performance standpoint. Extras Review: Other than subtitles for French and Spanish (why no English, MGM?) the only extra is a trailer that was apparently pan-&-scanned for television; the names of cast members are cut off on each side! It's dupey and visually unpleasant compared to the feature. Chaptering is just adequate. A classic black comedy/horror film in a disappointing presentation. Lacking any meaningful extras, it's definitely worth a rental.